A catastrophic earthquake struck Haiti on January 12, 2010. The 7.0 magnitude quake was centered offshore the populated capital of Port-au-Prince. One of ten deadliest in history, causalities range from 50,000 to 200,000 people. Almost three million of the country’s nine million people are affected, and many are still trapped in the rubble. Aid efforts have been hampered by the scale of impact and current instability of the Haitian government. Survivors are in desperate need of drinking water. Running water is not available due to damaged pipes. A lack of clean drinking water after this type of disaster can lead to dehydration and widespread waterborne illnesses. The Government of Haiti commandeered two water treatment facilities and is sending water to the capital in trucks. Four US ships are en route with desalination units to produce 25,000 liters of water a day. Another aircraft carrier, stationed off the coast, can produce 35,000 liters of water a day. Two NGOs, Water Missions International and Oxfam, left water-filtration systems in the country. Red Cross is dispensing bottled water, food, and medical supplies. UNICEF is distributing water and sanitation supplies to help protect the health of children. 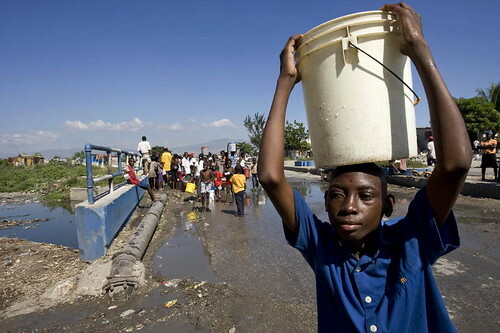 Above Photo: Survivors collecting water from a broken water main in Haiti. Courtesy United Nations Photo on flickr. Previously established in the country to work on water-supply concerns, they shipped 10 desalination units to the region after the quake. They are collecting money for water-related relief efforts. In September 2009, this organization committed to provide safe drinking water to 50,000 people in Haiti. Now they are helping re-establish local water-focused NGOs. They are collecting donations to restore/expand water services in Haiti. UNICEF is focused on distributing supplies related to water and sanitation, therapeutic food for infants and small children, medical supplies, and temporary shelter. They just appealed for donations of 120 million USD to help with relief efforts in Haiti. This long-standing NGO is distributing emergency water purification tablets to local hospitals. They will distribute water purification tablets, buckets with covers, jerry cans and other water containers, hygiene kits, high-energy biscuits, plastic sheeting and cooking kits to 50,000 to 75,000 people in Haiti. This well-known organization recognizes that clean drinking water is “the most immediate problem.” They are shipping 10 tons of water, sanitation, health, and shelter equipment to the area and collecting donations for these endeavors. This NGO, based out of New York City, is dedicated to raising money for water-supply projects in developing nations. They are accepting donations for health-related (that is, water, sanitation, etc.) and general efforts for partner NGOs in Haiti.